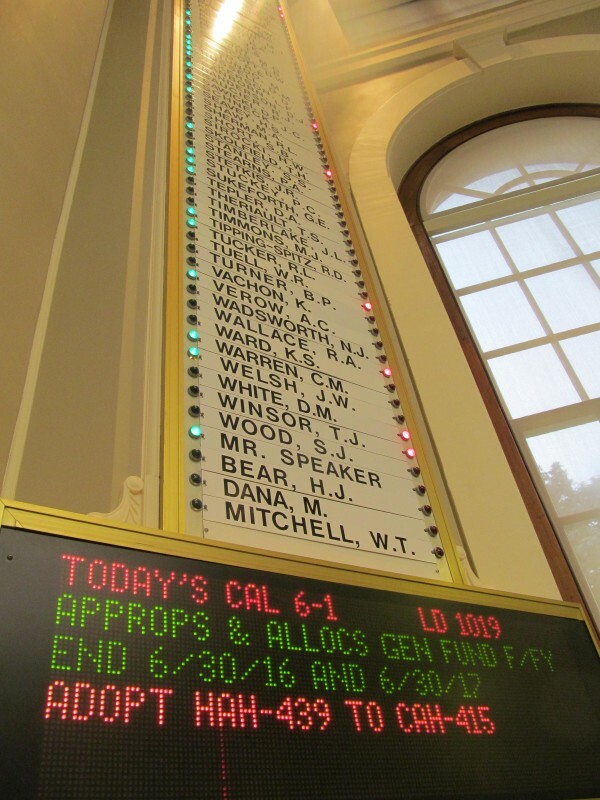 Democrats in the Maine House of Representatives watch votes tally on an amendment to the biennial state budget on Tuesday at the State House in Augusta. AUGUSTA, Maine — Legislative leaders on both sides of the political aisle Tuesday defended a $6.7 billion state budget and tax bill that largely was crafted by secret negotiations among party leaders. Their chief defense for the secretive nature of the negotiations was that they ran out of time to follow a more public process. Changes to a budget bill that previously was approved on a 9-4 bipartisan vote of the Legislature’s budget-writing Appropriations Committee came in the form of a series of amendments, including one that dramatically revamps the state’s tax policy. Those proposed changes were presented to lawmakers in a series of caucus meetings Monday night and Tuesday morning both at the State House and at private locations outside the Capitol complex in Augusta. The public was not invited to the meetings, and no notice was given to the media. By Tuesday morning, specific details on the proposed changes were still unclear as at least one staff member for House Speaker Mark Eves, D-North Berwick, told a reporter they would know what was in the budget once it was voted on by the Legislature. The closed-door nature of the negotiations and tightly controlled dissemination of information prompted the resignation from the Legislature’s Right-to-Know Citizen’s Advisory Committee of Mal Leary, a veteran state government reporter for the Maine Public Broadcasting Network. Leary, who declined comment for this report, did issue a letter to his fellow board members about the secret deal reached by legislative leaders. Rep. Peggy Rotundo, D-Lewiston, said the process employed by Eves, Senate President Mike Thibodeau, R-Winterport; Senate Minority Leader Justin Alfond, D-Portland; and House Minority Leader Ken Fredette, R-Newport, was unlike anything she’s seen during her eight terms in the Legislature. Rotundo, who serves as the House chairwoman of the Appropriations Committee, said the amendments being proposed to the bill her committee produced on the budget were substantial. A number of lawmakers Tuesday lamented the lack of transparency in the process, saying they were concerned there was an increasing trend at the State House to evade difficult discourse and avoid possible conflict by holding meetings beyond the public’s view. Rep. Jeff Timberlake, R-Turner, a member of the Appropriations Committee, in May during one late night session also urged his colleagues to hold more of their conversations about the budget in public. Timberlake also said he wanted the committee to take votes on the budget, line-by-line in public so everyone would know where lawmakers stood on the plan. “I said at the time, it’s time we moved this out [in public] and that we go line by line and take our votes at the table,” Timberlake said. While Maine’s public meeting law does not specifically address the Appropriations Committee, it does list topics that government bodies in Maine, including the Legislature, can discuss in closed-to-the-public meetings. The law is clear that “budgets and budget proposals” are not among those items. Also unclear is whether lawmakers, when meeting in their respective party caucuses, should be allowed to discuss official state business or whether those discussions should be restrained to discussions of party business. When pressed Tuesday about what his caucus was discussing that morning during a meeting that media members and others were asked to leave, Fredette offered no comment. Lawmakers had only a few hours to consider the changes the amendments would make, including ones that increased and expanded the state’s sales tax and ones that reduces income taxes for thousands of Maine taxpayers. Fredette said the details of how he, Alfond, Eves and Thibodeau reached their agreement were largely irrelevant as the bill would bring a tax cut to a large number of Maine residents and would be broadly supported by lawmakers. Fredette and Thibodeau also dismissed any concerns that specific law changes or new tax and spending policies were being put in place without appropriate public scrutiny. Both said that most of the general concepts that ended up in the final budget proposal were the subject of public hearings earlier in the year. He also said that amendments made on the floors of the House or Senate were never given any public vetting. Other lawmakers said when a bill is changed substantially, it can and is frequently referred back to the committee of jurisdiction for further consideration. Rep. Diane Russell, D-Portland, serving her fourth term in the House and a member of the Taxation Committee, said she has become increasingly concerned that lawmakers were not being transparent as they crafted tax and spending bills. “I think the public should have an opportunity to weigh in,” she said. But lawmakers were facing a deadline in needing to pass a budget by June 30 to avoid a government shutdown. “Unfortunately we have zero time as we are about to shut the state down, and I can’t justify shutting the state down,” she said. Still, Russell said she believed some of the aversion to doing the public’s business in public was bordering on corruption. Rep. Adam Goode, D-Bangor, House chairman of the Taxation Committee, said Tuesday he was satisfied that most of the tax proposals in the plans being advanced by leadership had been discussed. Goode went on to say many of those discussions, which included the “chairs and leads” — the co-chairs of the committee and the lead lawmakers from the Senate and House for each party — occurred in private meetings that were not noticed to the public or open to the media. “There are types of legislators who are absolutely uncomfortable in public talking about difficult things and that is not right,” Goode said. He also said a number of party leaders, “and I’m not going to name names,” were that type of legislator. “If somebody tells me what they think in an effort to convince me to vote a certain way and they can’t say it publicly, I’m a lot less likely to follow their advice,” Goode said. Advocates for open government in Maine and supporters of the state’s Freedom of Access Act, which governs public meetings and records, said legislative leaders continue to sidestep the law and ignore its intent. John Christie, executive director of the Maine Center for Public Interest Reporting, an Augusta-based nonprofit that produces investigative journalism for newspapers and runs its own news website, said Maine’s FOAA law seemed clear to him.